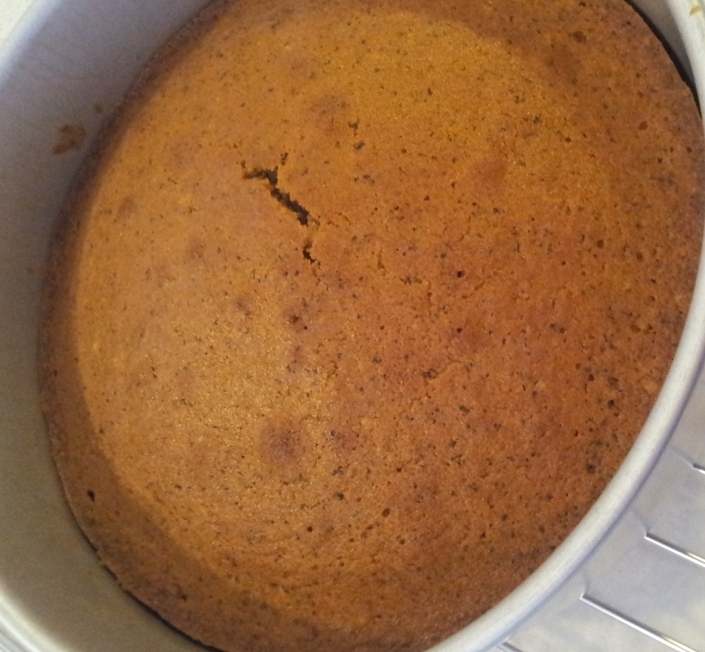 So, I decided to experiment around for an earl grey tea cake. The result was surprisingly really good… I love the soothing hint of earl grey taste with every bite. The cake was really moist too. 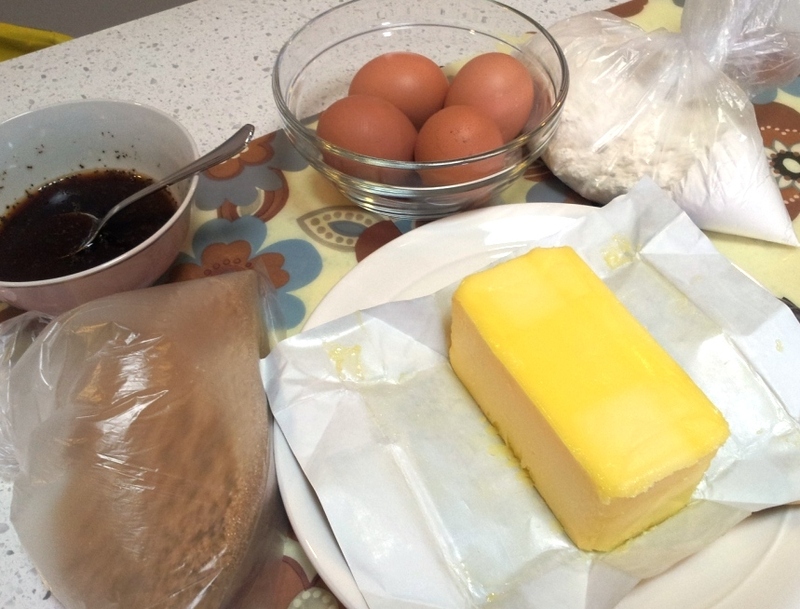 Yummz… And it’s so easy to make with really simple ingredients. 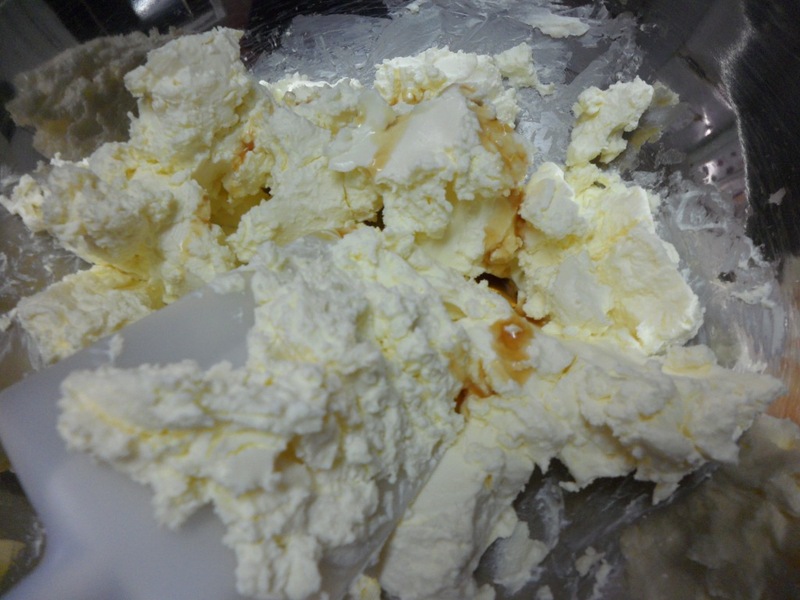 Cream the butter and sugar with a mixer until content is fluffy. Add the egg one at a time. 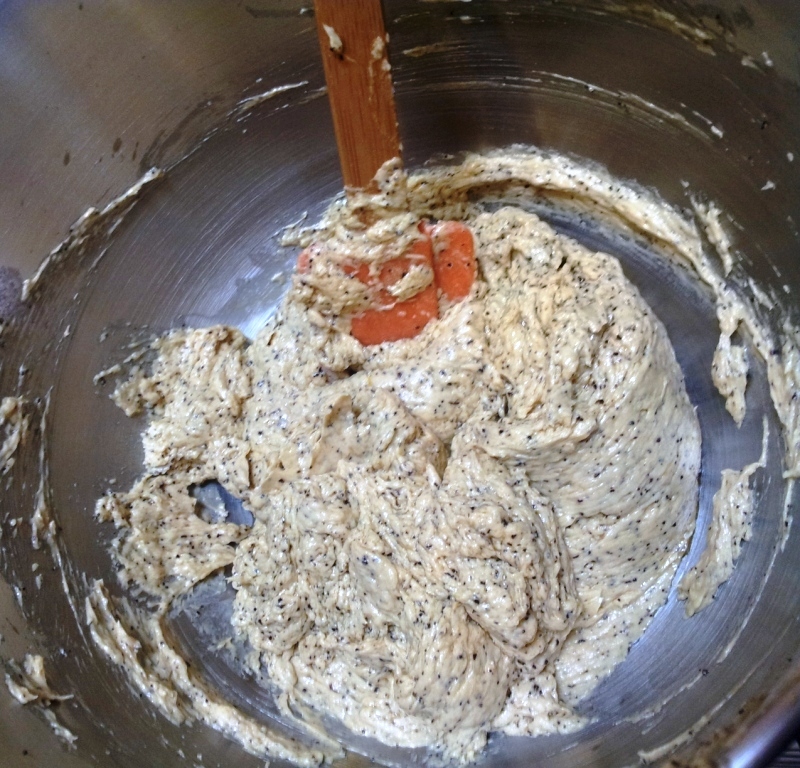 Once you finish adding the egg, add the tea concentration and vanilla essence. Make sure everything is well mix. The color of the batter gets slightly darker over time. 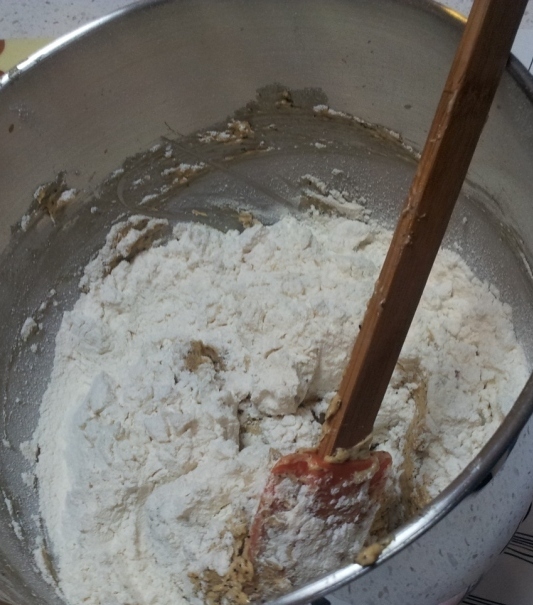 Remove the bowl from the mixer and sieve the self raising flour into the bowl. 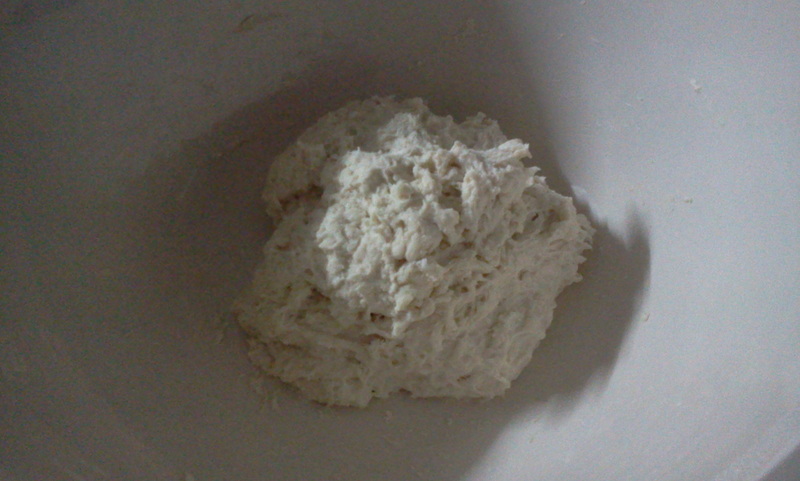 Gently fold the flour with the wet ingredients. Grease an 8 inch round baking tin. 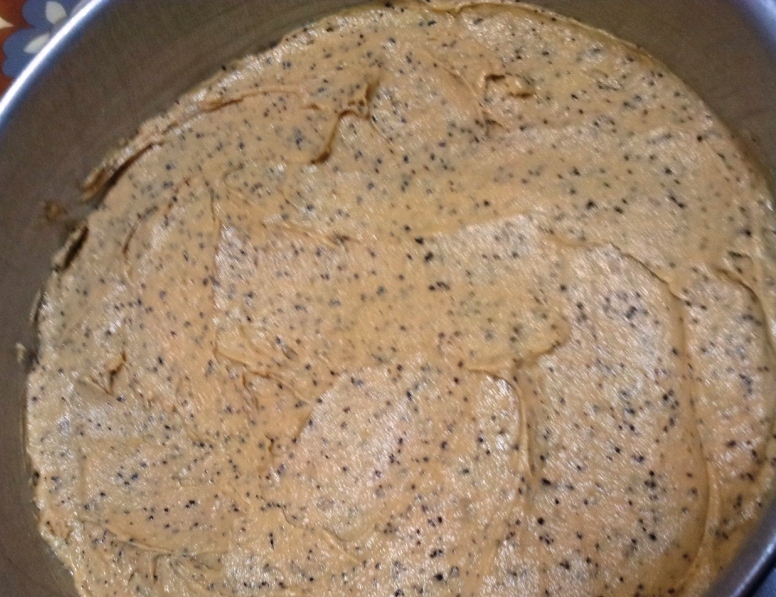 Pour the cake batter into the tin and spread evenly. IF you don’t like the little dome shape on your cake, just push the batter to the side (creating a like valley in the centre of the cake). This will give you a flatter cake. Personally, I love the little dome shape. 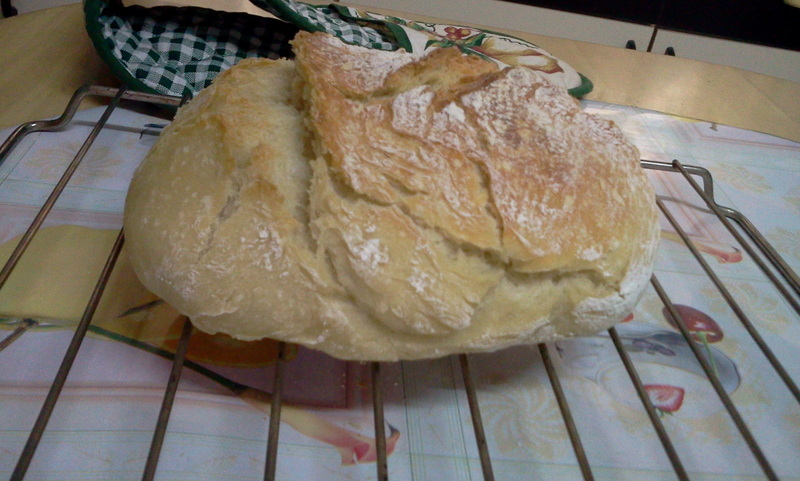 (hehehe… looks more authentically home baked). After 45 mins in the oven, here you have it. Beautifully moist earl grey tea cake. Yum yum… I forgot to take a picture of the cake after i cut it open. But, the color was amazing. *** The can peaches got from the supermarket here (around KL area) are all soak in syrup (couldn’t find those that are soaked in juice). It is a little sweet to me. So, what I do is to wash these peach with water, and then, let them drip dry before I cubed ‘em up. The can I got has 6 halves inside. Try not to get those which are already cubed as it tends to be softer. You would like to have the layers of different texture between the creamy cheese fillings. Placing all the biscuit into a zip lock bag, I used a rolling pin to crush up them up finely. Then, I pour these into a bowl and add the melted butter. 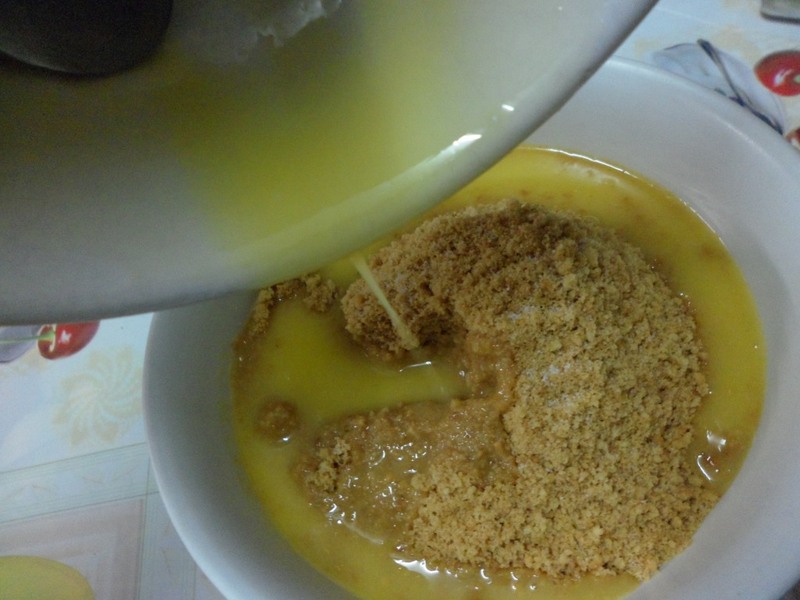 (For the melted butter, there’s no need to waste energy and time melting it in a pan. Just throw them into the microwave for about 16 sec. And it will be nicely melted – easy). I like the base to have a bit of saltiness in it to contrast with the sweet cheese. 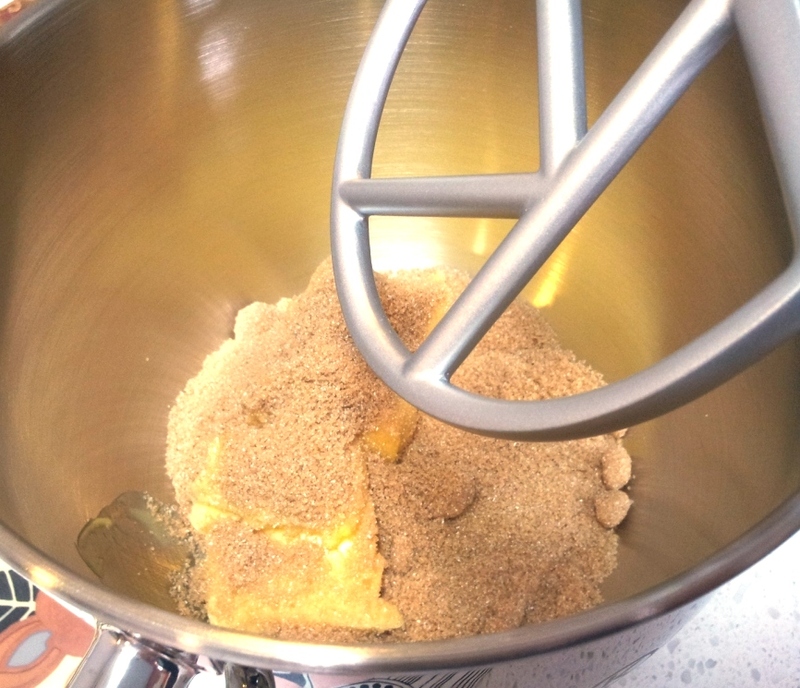 Mix them up until the crumbs resemble wet sand. Pour everything into a pan and pack them down. (You can use back of spoon, your fingers or anything you feel comfortable with). Once the biscuit is done, I place them into the freezer. 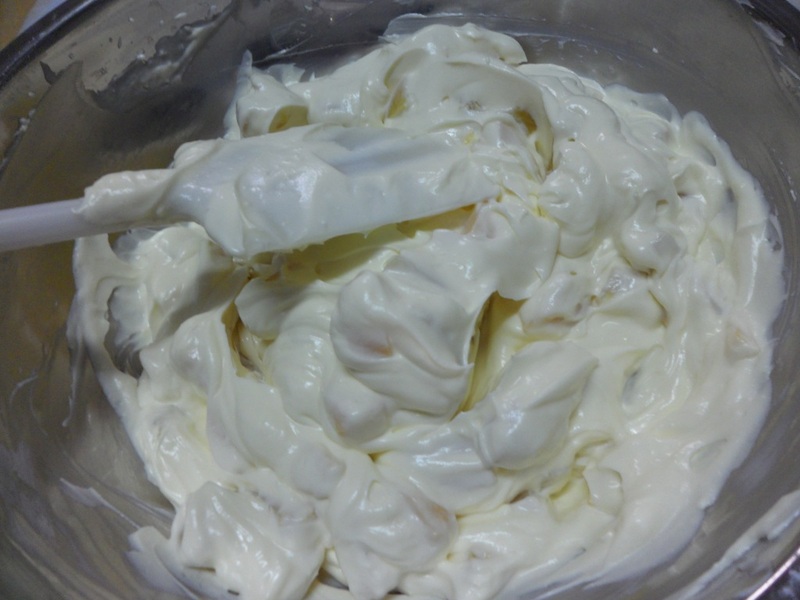 Cream Cheese (in room temperature so that it is soft), icing sugar, vanilla and lemon juice are all placed into a big bowl. Whisk all these to a creamy texture. Once all these are mix well, add in the Crème fraiche and continue to stir. The texture reminds me a little of mayo. Next, scoop in your peach. Remember to try and get them as dry as possible as introducing liquid will dilute the cheese and makes the base wet. Then, pour the cheese filling over the base. Smooth it out on the top. Wrap the tray with aluminum foil and let it sit in the fridge for about 8 – 12 hours. As this is a relatively soft cheesecake. I prefer to let it sit for more than 24 hours before slicing it. 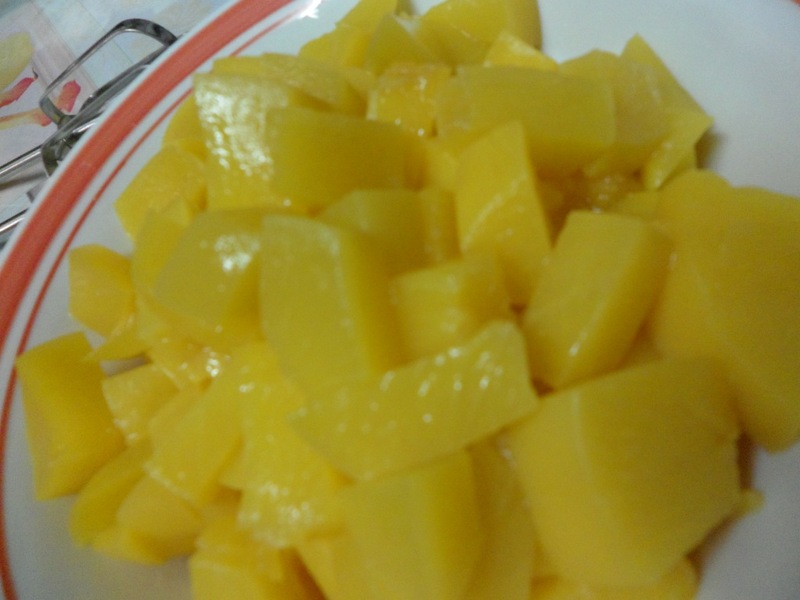 You can add slices of peaches on top if you want. For me, I don’t bother as I find that it is a mess to slice them later. 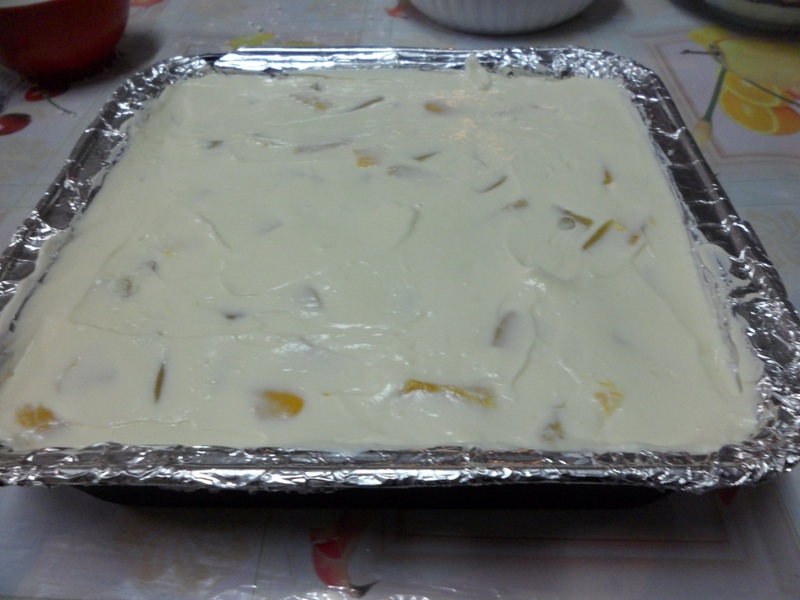 And I prefer to have the cheesecake in square tray as this is so much easier to divide and slice. 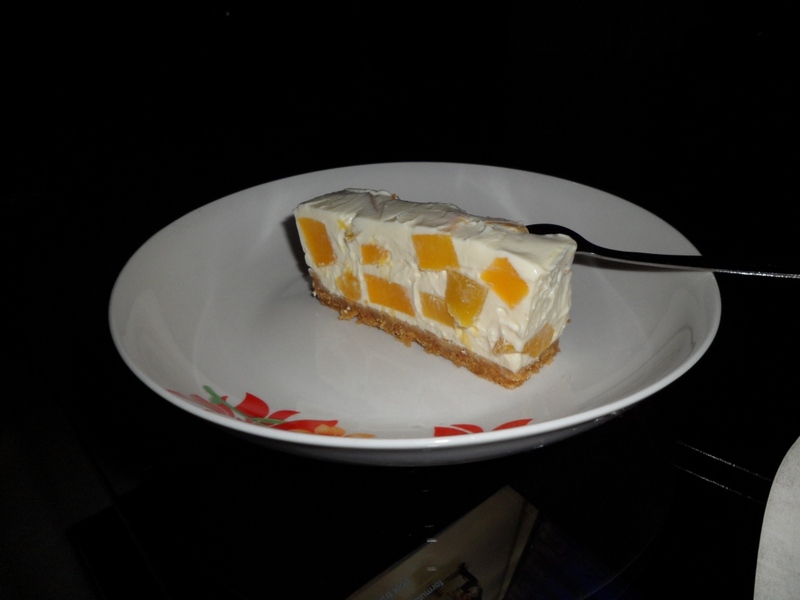 Look how amazing it looks with all the little cubes of peaches all over the cheesecake. Chulet LOVEs having a slice of this gorgeous yummy treat while sipping on espresso. Divine indeed. Enjoy ! Yes yes – we don’t know how lucky we are. But, imagine having bread everyday!! AND on top of that she will bake tons of other stuff. So, the novelty wear off after 10 years !! Anyway, now that she has retired. She REFUSED to bake anymore. le sigh.. Considering that I grew up with a baker / cooking instructor, many relatives think I should be blessed to know how to bake as well. Sadly, I don’t. I only know how to eat those breads and cakes. I was only forced to learn how to cook when my mom pack me off to Australia. The first meal I prepared for myself was a disaster. Rice was half cook. Chicken tasteless. Broccoli half cook (and I just throw them in hot water). It was a sad sad dinner indeed. While sitting down by myself, eating horrible tasting food, I realised how fortunate I am to have nice tasty food all this time. After that, I was determination to learn to cook. During the summer holiday, I went home and started bugging mom and my aunty to teach me how to cook. 10 years plus later, I think I am a pretty passable cook now. Recently, I started thinking about making my own bread. Seeing my friends with their babies made me realised that I would love to be able to give my kids freshly baked bread too. Just like what I had during my childhood. 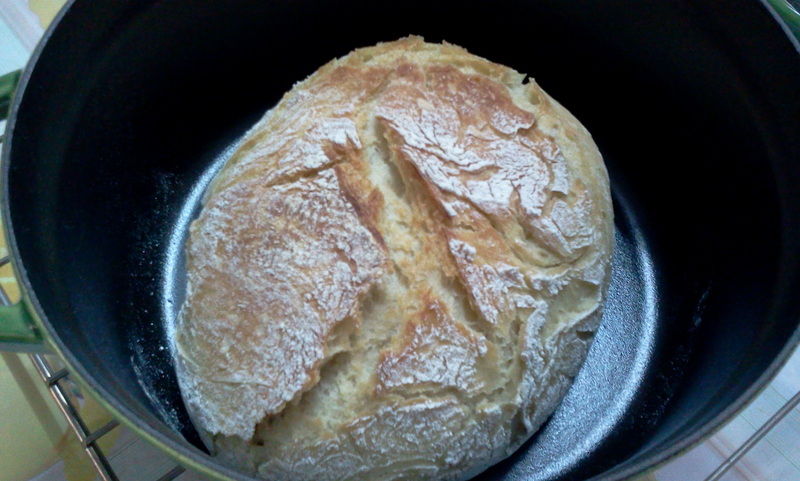 So, being a zero experience baker, I was so excited when I come across the No -knead bread. Wow. This is so easy. Everyone says that even 4 year old can do it. So, I set off to give it a try. Last night, I measure everything and get the dough ready. 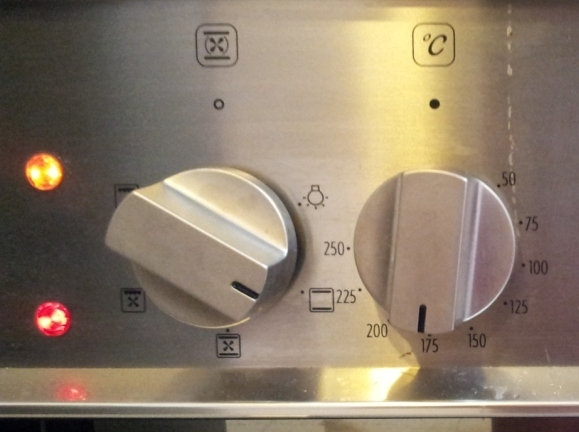 The recipes calls for 12-20 hours of rising time. I thought since I am in a hot and humid country, 10 hours should be sufficient. I waited patiently. (in fact, I was so excited I hardly sleep the whole night). Around 6 am this morning, I woke up to prepare the bread. It has risen nicely. Took it out. Folded it as per shown on you tube. Throw it into my Staub cast-iron pot (which was pre-heated) and ran back upstair to shower. I let it cool on the rack before slicing it. It was a GREAT disappointment. Inside was dense. Not much big bubbles which I have seen from other people’s blog. the only plus point is that the crust was nice and crispy. ARGHHH…. I failed. sobbb sob..